I am a strong advocate for cameras that use four AA batteries, and would really like to hear the camera had eight. I have a systematic ritual of charging the 24 AA rechargeable batteries I now carry, but there is another question. Are they charged, how do I know? 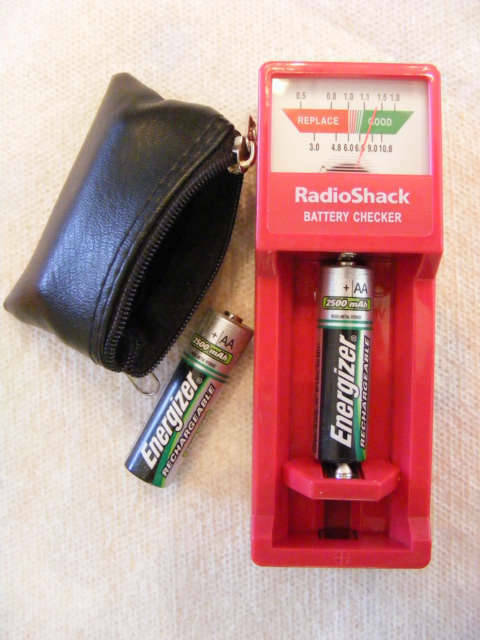 Battery tester I purchased at Radio Shack in the Mall at Fort Wayne, Indiana. Thanks to Radio Shack and a 10-dollar bill, I now have a solution to a serious problem for photographers. I have charged batteries many times and when I placed them in the camera, I say oops, no charge, I try the next, and hope, sometime all are dead. Whether they go dead by touching each other, or over time, or the charger is broke, there is no clear reason. I am planning to go off the grid up to my ears in trees, maybe called Jungle in Africa, I also want to go to the Amazon River, and find some isolated tribes. What I need is to KNOW, not hope my batteries for my camera are charged. Now, I will know, I can charge up all 24 batteries for eight loads of my camera and I can take photos for roughly eight days, I am sure it will be only 5-6 because something else will go wrong. Thinking about buying another 12 or more batteries, they just weigh a lot and they will not allow through some airport, does not matter, too many batteries makes airport people nervous or greedy, I lost about 12 in the Delhi, India airport to an real jerk airport officer, and just another reason to not like India. Many cameras have this lithium custom battery for the camera, when I see them, it makes me nervous, the only way to replace that battery is to pay 100 dollars and wait 7 days to receive it from the USA by FedEx and hope customs does not make my life difficult. Battery management, truly not as simple as people imply or explain, then again if you really do not take many photos anything is easy.